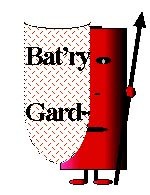 Bat'ry Gard protects your calculator batteries. Costs less than one set of batteries! Bat'ry Gard has invented and patented a locking device for the battery compartment of calculators, CBL's and the new LabPro. This prevents battery theft from these devices. Stealing a calculator, with Bat'ry Gard installed would be of no value since one cannot use a calculator with dead batteries. Bat 30 or Bat 100 for calculators made before Dec 1999. See details below. The "Removal Tool" works with all types and is required to installation and remove. One tool removal tool for each teacher using the device. Since Dec 1999, Texas Instruments has changed the battery compartment on its TI-83+ calculators. Check the date code on the back (use the first four of the last 5 numbers - eg. 05981 is May 1998). If your calculator is a TI-83+ and the date is 0999 or later, order the Bat 30 plus or the Bat 100 plus.